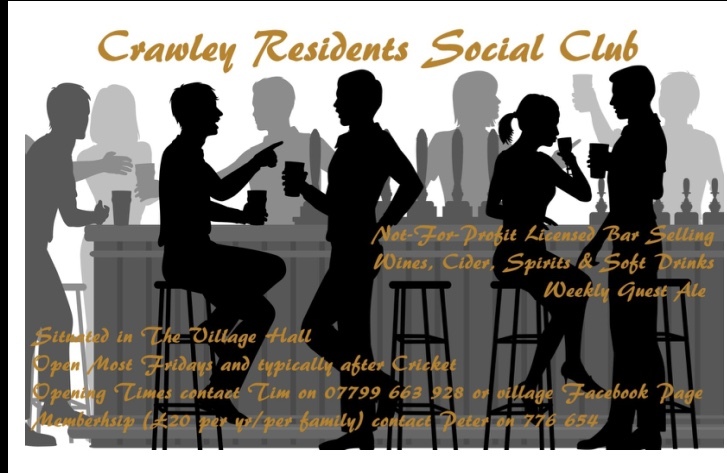 The Residents Social Club has been formed for Crawley resident families to meet up, have a drink and socialise. The Club is located in a room at the rear of the extension, beyond the games room - and will usually be open once or twice weekly. Opening times will generally be publicised in posts on the Village Hall website and on the village Facebook page. Membership costs £20 for each year (commencing 1 April) for a whole family, which also includes membership of the Family Sports Club. For more details on the Residents Social Club, please contact Tim Anderson on 07799 663928.